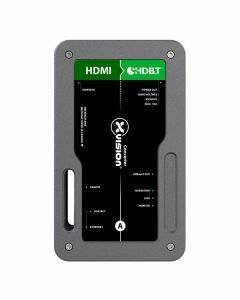 Transport 4K30 signals and Ethernet over up to 100 meters of CAT6 cable, with HDCP support, no compression and no latency, all with no external DC adapter. Rugged, Tour-ready and aesthetic enclosure : The sexiest widget in your tool box, that will keep looking good for years to come. Plug-n-play operation ; No dipswitches, buttons or menus to fumble with : It just works.